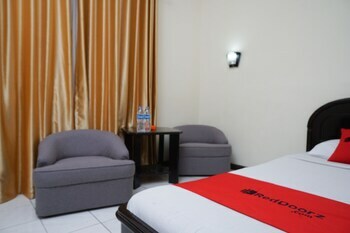 Located in Bandung, RedDoorz @ Cipaku is a 4-minute drive from Indonesia University of Education and 6 minutes from Villa Isola. Featured amenities include a 24-hour front desk and luggage storage. Free self parking is available onsite. With a stay at ZEN Rooms Kerobokan Seminyak Villa in Seminyak, you'll be within a 15-minute drive of Seminyak Square and Eat Street. Free self parking is available onsite. Located in Jakarta, SARE Suites is a 2-minute drive from Golden Triangle and 9 minutes from Satria Mandala Museum. Free self parking is available onsite.